What do we want? Rewards points! When do we want them? Now! Everyone knows that building up enough rewards points to snag a free flight, a new computer or a sizeable gift card can be time consuming, especially if you’re sticking to a budget (hint: you should definitely be sticking to a budget). Your first step in building a stack of rewards points should be to sign up for a credit card that offers an awesome signup bonus. This is one quick way to snag thousands of rewards points all in one hit. Just remember to keep one eye on the fine print - there may be a minimum spend, or a time frame in which you need to spend before you can claim your bonus points. Another pretty simple way to earn extra points is to shop at the right places. By shopping at partner stores, you can earn up to 3 points for every $1 you spend. So check out what businesses are partnered with your rewards program and try to do most of your spending there. Or, you can go the other way, and choose a rewards card that will let you shop at your favourite spots. 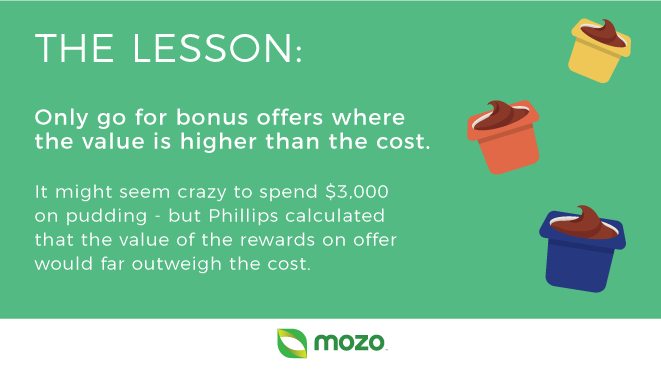 Sometimes businesses run bonus campaigns where you can earn extra points for buying certain products. Keep up to date with offers like this, but don’t get carried away - if it wasn’t something you were going to buy anyway, then chances are it's not worth spending the money just to get the points. David Phillips, AKA, the Pudding Guy, is something of a legend among frequent flyer rewards lovers. In 1999, Healthy Choice was running a promotion for a new line of frozen entrees, and offered shoppers 500 frequent flyer miles for every 10 product barcodes they sent in. Plus, as an early bird special, those who sent in their barcodes in the first month would get double that. Sounds good right? Phillips thought so, and he set out to buy up the best value Healthy Choice product he could find - single serve pudding cups for 0.25 cents a pop. After totally cleaning out a chain of discount grocery stores, Phillips had bought up 12,150 pudding cups and spent about $3,140. When he sent in his barcodes, he wound up bagging 1,280,000 frequent flyer miles - enough to travel free for years afterwards, but also enough to get him a complimentary lifelong membership to the airline’s Gold club. And as if that wasn’t enough - he donated the pudding to a local charity, and so was able to claim $800 of his spend back as a tax deduction. Does that mean we think you should spend $3,000 on desserts? No, probably not. But, when you consider that the miles Phillip claimed had a monetary value of over $150,000, you have to admit, bonus offers like this are worth looking into. And when we say everything, we mean everything. Flash your plastic when you hit the checkout, but also use it to pay for dinner out, movie tickets, online shopping, bills and subscriptions like Netflix or Spotify. The more you use your card, the more points will be up for grabs. The key here is that you’re not spending more than you would have anyway, you’re just making sure all your spending is going on your credit card. And don’t forget - if all your spending is going on plastic, it’s super important to pay your bill off in full each month so you don’t pay any interest. Don’t just put your spending on your credit card - put everyone else’s on it too! When you’re out for dinner, why not offer to pay the bill on your credit card, and then your friends can pay you back in cash. That way, you’ll get the most points possible and your budget won’t be any worse for wear. For trusted friends and family, this can go for other big ticket purchases, like electronics or furniture, as well - just make sure they give you the money before you have to pay your credit card bill that month. You don’t have to be present to cash in on other people’s spending. Look into getting a supplementary credit card - it will be connected your bank account and your rewards program, but your spouse, child, or other family member can carry it with them. With two people spending, you’ll earn double the points! One thing to remember is that while some cards come with free supplementary cards, others charge a fee. Make sure the cost of paying this extra fee won’t outweigh the value of the additional rewards points. 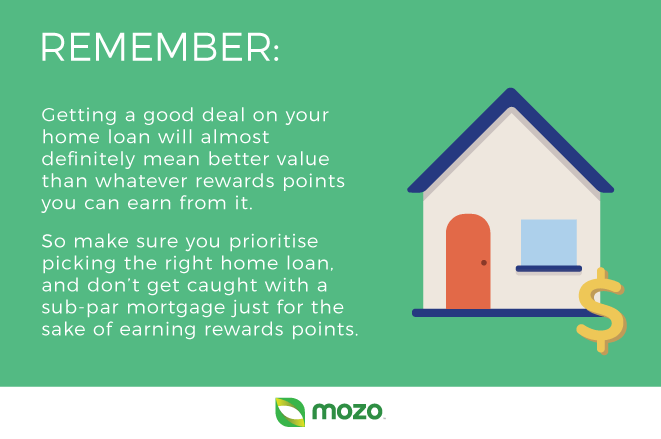 Another way to earn a bunch of points quick, is to choose a home loan that comes with a rewards point offer. There aren’t a heap around, but a number of mortgages give you the opportunity to earn rewards points on the balance of your loan. So if you happen to be in the market for a home loan, or if you’re refinancing your existing loan, think about searching out one of these offers. Time to renew your credit card and cough up the annual fee again? Think about calling your provider and asking for a better deal so they can keep your business. By doing this, you might be able to get them to waive the annual fee or offer you bonus rewards points. But remember - for this to work, you’ve got to be willing to bluff about cancelling your card. So now that you’ve got a strategy or two for earning rewards points under your belt, take a minute to get familiar with some of the pitfalls that could undo all that hard work. Overspending. The number one trap to look out for is spending too much in the pursuit of rewards points. All the above strategies depend on spending in the right way and the right places, not spending more than usual. So if you find your bills are getting out of hand even as your points stack is growing, it might be time to reevaluate your spending. Balance transfers. Don’t think that dropping a large existing balance onto your rewards credit card will bag you a stack of points straight away - in fact, you won’t earn any points on transferred balances. Only new spending will earn you points. Missing repayments. As you’re racking up a tonne of rewards points, make sure you’re prepared to pay your entire balance off in the interest free period. If you don’t, the cost of paying interest might quickly outstrip the value of those hard earned points. 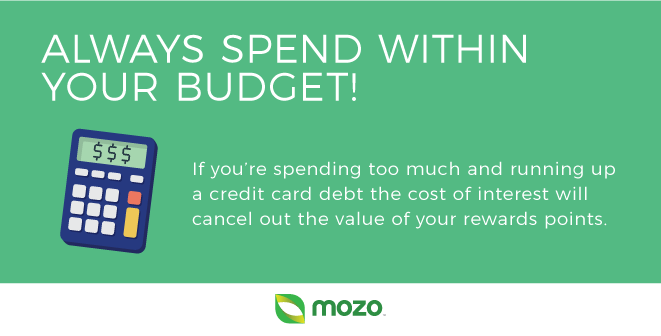 That’s why it’s important to have a budget set out for how much you can spend (and pay back) each month. What other card features should I consider? Points value. When you choose a rewards card, you’ll earn a set amount of points per dollar you spend. As a general rule, aim to earn at least 1 point for each $1. And keep in mind that on some cards, after you spend a certain amount or earn a certain number of points, the earning power of your spend might drop. For example, you might earn 1 point per $1 on the first $2,000 you spend in a month, then after that, you might only earn 0.75 points per $1. Points cap. While there are plenty of rewards cards out there with no limit to the number of points you can earn, others cap points on a monthly or annual basis. Check the fine print and know what caps apply - that way, you can plan your purchases to avoid big spends when they won’t contribute to your points pile. Expiry date. Another piece of fine print to be aware of is the points expiry date. Again, while some cards will let you pile up points that never expire, on others, your points stash will expire after a time limit, usually of around 36 months. 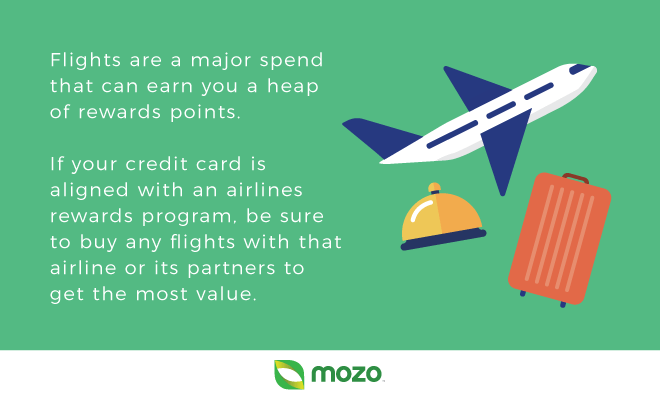 This means not only do you need to use your points before they disappear, but you should also plan your spending to ensure you’ll have enough points to get a reward you really want before they expire. Annual fee. Rewards cards often come with a hefty annual fee attached. That’s not always a deal breaker, but you’ll need to weigh the cost of the annual fee against the value you expect to get from the rewards program and decide if it’s really worth it. Interest rate. As with any credit card, check the interest rate on offer and make sure it’s not going to put a strain on your budget. Ideally, you’ll be paying off your balance in full each month and not paying a cent in interest - but just in case you miss a payment or two, it’s always handy knowing your interest rate is as competitive as possible. Ready to earn yourself a sky high stack of rewards points? Compare rewards credit cards and find the best piece of plastic to make it happen.